Do you remember a time before having to remember to move the bloody Elf on the Shelf? Before Hatchimals were on every child's present list? Before gifts were wrapped in shabby chic brown paper and tied with string? And before Pinterest encouraged us to make our table displays look worthy of Home Interiors magazines? Do you my friend remember when Christmas Day...was just a bit well crap? Not crap as in crap, crap. No believe you me my Christmas day memories are some of the happiest times in my life. Crap as in it was a bit haphazard and simple and just well a lovely kinda crap. So here are the things I will miss most about Christmas now we are all modern and sh*t.
Ah the joy of non child friendly decorations. Bright glass baubles that were used year on year on year. From Woolworths no doubt. They precariously hung there waiting to drop and smash. Maybe on a child's face. The tinsel that was a bit threadbare and I don't really remember any other colours existing bar silver. Maybe a gold? That was it. I think Paperchase now model a lot of their decos on the tat that was around in the 80s. Which shows how ruddy fab they were. I ask the kids I teach to describe their best Christmas and it always inevitably involves the latest iPhone and a tablet. For us? ALL WE WANTED WAS A NICE BIG BIKE! YES! Remember? Just a bloody good big bike. That your parents would have lovingly put spokey dokeys on. Or a Barbie set. Or an Action Man. Mmmmm that was it? Also presents came in sacks. Some may say "well that sack looks like a bin bag but with Father Christmas's face on it". And they would be right. To be folded away nicely and used the next year. Snore. Off. X. Factor. The Christmas number 1 was like a proper massive deal! I used to tune into the Top 40 ready and waiting to find out what beauty it would be, with tape recorder ready and poised. And you know why people loved being Number 1? As they got to sing the song on Christmas Day TOTP. Yes I am aware this is still on, and now has the added bonus of pressing the red button so you can sing along. Which would have BLOWN MY MIND in 1987. 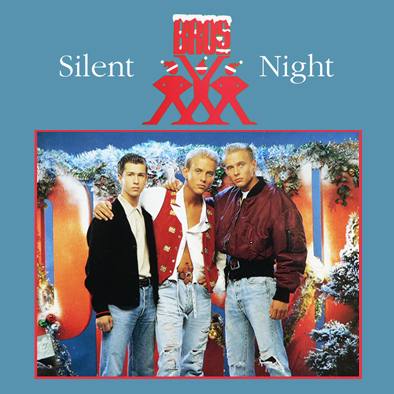 But I will be honest I would rather see Bros singing Silent Night than some random youths twerking to crunk music. Or whatever the hell it's called. Breakfast? Was a selection box. Morning snack? Was a selection box. A turkey dinner hastily shoved down your gob in time for TOTP and then the rest of the afternoon? You finished off your selection box. There was non of this two selection boxes for £1.50 sh*te or a 'multipack size' b*llocks. No. It was like a proper present that would be wrapped up and enjoyed. Much like your Mother would enjoy the treat of Milk Tray that your Dad would have got her. The presents were ace. The food was ace. The music was ace and the decorations? Well they were a little tiny bit dangerous and sh*t but the TV? THE BEST IN THE WORLD! TV didn't really start gearing up until about 9am-ish where you would have Noel Edmond's Christmas Presents on. I remember weeping a little bit but trying to hold it all together whilst looking at my new red walkman. Then you would sit down and talk through the whole of the Queens speech. Next? The BIG film. Now as there were only four channels. You generally had a choice of two. Gremlins maybe? Or ET. And then on the evening? The country was united in the love that was The Only Fools and Horses Christmas Special. Or you may have spent your whole day riding around playing out on your new bike. Either way? It was fab. That pretty much summed up my best Christmas Days. Your's may well have been different? Or may have been the same. But I can promise you one thing. All of us collectively together will remember...the year Mr Blobby got to Christmas Number 1 (I know this was 90's but it was still funny as f*ck)! This picture serves no actual purpose bar the fact it made me howl with laughter! Oh my goodness, I miss these Christmases. I still have decorations like that on my tree, some are over 50 years old!! I remember ET first being shown on TV on Christmas day. It was such a big deal. Those were the days! Although, to be honest, our Christmases might still be a bit like this! We don't have an Elf and nothing in our house is worthy of Pinterest. And I still watch TOTP Christmas, although it's not really the same any more! I've was thinking about 80s Christmas decorations as we decorated the tree. As we put on the understated white lights I started thinking of the multicolored lanterns, bulbs with some flower thing at the top, and the fruit shaped bulbs we had in my childhood! I wish we'd taken pictures of the Christmas tree back then so I could revel in the mass of colour.